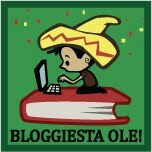 Bloggiesta! – my books. my life. Catch up on reviews. I have about 6 or 7 to write I think. Finish my review database. I’ve been slowly linking old reviews for a LONG time now and I’d love to be done with it. Fix old posts. The formatting on my old posts is off even after being here at this version of the blog for over a year. It’s a bit sad. Get a new series going where I talk about books I read before I was blogging regularly. This has been in the works for awhile and I just need to finally do it. I am sure that I will find some other things to do as I browse the mini-challenges. I’ll just update this post as I go instead of spamming your feed reader with new posts so check back if you’re curious how I’m doing. I’m looking forward to chatting with everyone this weekend as we are all super productive. Buena suerte! Linked all of my reviews. Fixed the formatting on all of my posts. Created a book/review list by title. Entered all of my new books into the catalog and shelved them. Watched Downton Abbey Episode 2, one episode of Buffy, one episode of Angel, and four episodes of Glee. I also decided to paint my china cabinet this weekend and that’s taking up a significant amount of my time. I’ve primed and put one coat on so far. I really should be joining in on this event, but I don’t feel like I have the time right now. HAVE FUN! Good luck working through your list. I achieved a lot in the first couple of hours of Bloggiesta, but have lost momentum. Hopefully I will some more done once the kids are in bed tonight. Great list. Good luck on it all!